For anyone who shoots frequently or owns a rifle, rifle cases are crucial. It serves as protection for the gun, essential for travel and controlled storage purposes. For the durability of your rifle, and to ensure excellent performance all the time, consider investing in one of these best rifle cases that are under $100. Other than the gun, the best tactical rifle case also keeps equipment like scopes, magazines and other accessories safe. It is awkward carrying a rifle openly in public places, hence the need for a good case. 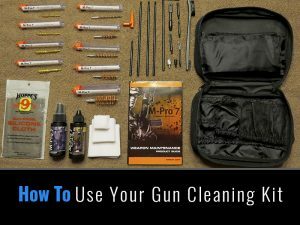 However, before going out to buy a rifle case, you need a bit of advice and guidance on buying the best rifle cases within your budget. When you have a high-quality case, you are sure to extend the life of the gun and keep it safe from scratches and dents during transportation. Here’s our list in no particular order. 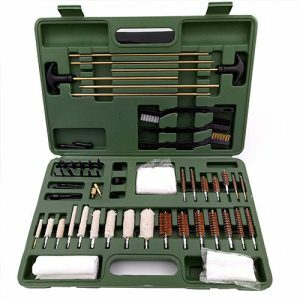 The gun case is made of high-quality woven Denier Polyester for enhanced tensile strength. It both strong and soft and can hold up to tough environments that would otherwise scratch, rip, tear, or fray the material. It includes four MOLLE webbing lines on the sides for additional pouch attachment. With this tactical gun case, you can fit two rifles easily and hold them down with elastic bands and protective sleeves. These measures prevent any unwanted rifle movements during transportation. It has EVA foam that surrounds the main compartment to provide the gun additional support and prevent abrasions between rifles. It has multiple accessory pouches with Velcro closure and zippers to store accessories safely during travel or for storage purposes. Its quick detach buckle system allows one to tightly secure gear and belonging. Its double Velcro straps keep the items on the top and bottom secure and make the bag more ergonomic for trekkers. The gun case has removable padded backpack straps to help evenly distribute the weight on your shoulders and back for a comfortable carry. You can also carry it traditionally using the padded carrying handle at the top. The back straps have accompanying chest straps for excellent stability and keep the bag in position even when moving fast on those long hikes into the back country. When you use Plano All Weather gun case, your firearm will be protected from the elements and physical damage. Its rugged industrial strength construction coupled with the continuous Dri-lock Seal gives it an airtight and watertight shield to protect the rifle even in the extreme condition and all types of weather. It is built with a heavy-duty lockable latches and pressure release valve making it stand up to the jarring and bumping of air travel. You will love the hinges that are protected with high strength and the over-molded handle. The internal dimensions of 36” x 12” x 5” inches give you enough room to carry most carbines and the high-density pluck foam protects the gun and accessories from bumping and getting damaged. Internal dimensions: 36″ x 12″ in. x 5″ in. This double rifle carry bag has its edges fully padded to give the gun maximum protection and keep it from unwanted movements that can cause damage when in transportation. Other than the two rifle slots, this tactical rifle case has exterior pockets for carrying additional accessories and equipment all in one bag conveniently. It allows the grid system, from Alice & Molle that expands the number of and variety of equipment you can carry. The zippers are lockable therefore enhancing the security of the gun and equipment. Even with this kind of security, it is still simple to open and close. There is more than one carry option when using this rifle case. It has a Hook and Loop carrying handle and padded adjustable backpack straps that keep your hands free. 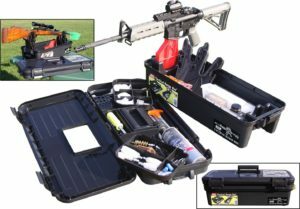 The NcStar gun case is a 36-inch double carbine case made of heavy-duty PVC material for maximum protection of two carbine-sized rifles. The extra PALS looping on the sides allow you to customize the case for specific carrying needs. It has a secondary compartment full of pockets for storing the extra optics, handgun, logbooks, and leaning accessories among other items that go with the rifles. On the exterior are three pockets for keeping the ammo and magazines organized for quick and easy access. The inner is padded with high-density foam to provide superior protection to the guns. The heavy-duty double zippers keep the case closed even in the roughest conditions. The inner dimensions of 35 by 11.5 inches make it suitable to carry most tactical rifles. Its scabbard is designed for easy mounting and carrying on tactical gear and is sturdy for heavy-duty use. Even though the rifle bag has no straps, it does not slide around when carried. The case is very ergonomic and has a Velcro padded wrap for both handles keeping them together. If your preference for gun carrying case is plastic, then the AR is the best option on the market. It has the Flambeau patented Zerust molded into the magazine divider to give it years of corrosion resistance. The lid and base are made of polypropylene and has an inside dimension of 40 by 12 by 4 inches. It is built with four safe shot latches and straps to keep the gun and magazine secure and free from movements during transport. The rifle case features integral handles that make it easy to carry and is large enough to fit many rifle sizes. The black hard rifle case ensures your weapon is protected from external forces and elements like water. It has Velcro straps for added security, whereas the magazine has its straps and organizer. The case can hold a rifle, a 3-n-1 scope, and up to eight magazines. These features make the Flambeau Tactical case one of the best gun cases less than $100 and our pick among these five. So many good gun cases are on the market and this can make it overwhelming and confusing if you’ve never purchased one. Here are the different types to help you in your shopping for the best rifle cases. These gun cases are very durable and provide the best protection for the gun. They have some foam to hold the rifle and accessories and provide cushioning to keep it safe from bumps on the outside. The best foam will not allow the gun to move or shift once you have closed the case. Some models allow customers to customize the foam for their type of gun, therefore, providing a custom fit. These types are very versatile compared to the hard cases. They are made from various material and offer excellent protection to the contents. They are relatively low-cost and lightweight and are perfect for trekking or extended hunting trips. Tactical gun cases are designed for tactical weapons and can be soft or hard sided. They are available in different quality levels and are mostly used by the military or law enforcement agencies. They are made of lightweight but strong material like polyester with high tensile thread and reinforced webbing. Their interior features heavy padding for excellent protection during transport and are available in various colors. There are those who prefer custom gun cases. These types are designed for specific guns and offer a perfect fit. These gun cases are built for specific rifles. 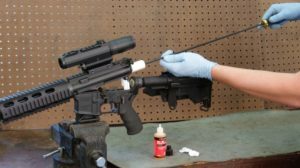 If it is a hard sided case, this means the foam is cut to specifications that will ensure each item in the case is secured for the best transportation and safety of the gun. The best quality, however, comes at a price, but this may be worth the investment. For those with more than one rifle and wishes to carry all for a hunting trip, this will be the best type of gun case. Other than transportation convenience, it is a money-saving option. It can be a hard-sided or soft-sided case depending on preferences. The best tactical gun case with a double capacity makes it easy to transport with it strapped on your back while hiking or moving in the bush on a hunting trip. Soft-sided cases are versatile and are made from a wide range of fabrics from leather, neoprene to nylon. They, however, do not offer the same level of protection as the hard-sided types. Their advantage is lightweight, quiet, and easy to manage. They are suitable for hunters who prefer a less bulky case or easy movement. To get the best protection for your gun, a hard-sided case is the best choice. Its hard exterior protects your gun from an external force that may cause a dent or any damage. They have foam padded interiors to protect guns from impact and to keep them securely in position during transport and for storage. Since different cases have different foam density, the lower end models may have very thin foam that may allow the gun to shift when you jerk it. Some models allow for foam customization for your specific gun to fit it perfectly. If you plan to do lots of activities in the outdoors, then a waterproof gun case is essential. Moisture can get into the case causing serious damage to the equipment especially to wood stocks. It is important that you wipe dry all your gear before storage since this type of case can also lock moisture in and encouraging corrosion. Do not forget to pick the right size of a rifle carrying case. You may have considered every aspect but when it comes to size, you fail to get it right ending in disaster. Check the size of the rifle you want to carry and if you want to carry it together with the accessories. Some people prefer a double carry case to fit two rifles and some accessories all in one pack. Some models have wheels for easy rolling along. Other come with shoulder and hand straps for comfortable transportation. In case you want to carry it on your ATV then look for the type that is convenient for the type of transport. There may be instances where you have to fly with the firearm. This calls for compliance with the airline standards and the TSA guidelines. Some airlines restrict the number of guns you can carry in a single case and some may not exempt gun cases from excess baggage limitations. If you spend time flying to your next hunt consider gun cases that meet TSA requirements. Your rifle is a valuable piece of equipment that you do not want anyone to tamper with or steal. This calls for secure gun cases that will keep all its contents safe during transport and when not carried on you. The latches need to be secure and durable, and if it has a zipper, ensure they are lockable and can withstand impact without opening up. Before settling on any gun case, note all the legal requirements in the states where you will use it. The case may be all that you desire, but without compliance with legal requirements, it will all be for nothing and may even land you in trouble with the authorities. Purchasing the best gun case doesn’t have to be a big challenge. Once you know about the different types available on the market and compare to your needs then the task becomes easy. When you have the best weapon carrying case, you can be sure to get the best protection and durability of your firearm. 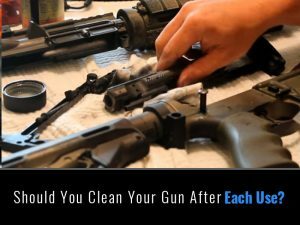 A good one will enhance the weapon’s performance as it will be stored securely keeping you from regularly adjusting the scope due to bumps and jostles during transport.